Since 2011 NMM has successfully organized movie screenings, Dance, Music and Marathi drama performances in more than 20 programs. NMM also publishes annual Diwali magazine “Rashmin”. Through these programs NMM has provided a platform for widespread talent across Netherlands, Belgium, Germany and other parts of Europe. We would act as an interface between a variety of social, cultural, and commercial initiatives in India and the European audience. NMM also promotes social perceptions of various other sectors which includes active involvement in social cause for various social projects in India. Till now NMM has supported social projects conducted by different social organizations from India like NAAM foundation, Aadhaar4U, ATMA foundation in one or another way. In the year 2018 NMM is bringing variety of programs for Indian as well as international audience. 1. Vasatotsav (mainly includes Nrutyotsav) – 24 March: After successfully organizing “Nrutyotsav -1“ in 2016, NMM proudly announces “Nrutyotsav 2”, which will showcase different Indian pure classical dance styles by artists from all over Europe. Various renowned dance schools will be invited to come and perform in this event. 2. Ganeshotsav 2018 – 15 September: Celebration of Lord Ganesha festival. The event starts with a grand procession of Lord Ganesha. It will be a full day event consisting various activities, workshops, competitions for kids and adults. At the end everyone will enjoy the delicious Indian food. 3. Pulotsav – 10 November: A big event being organized to celebrate the 100th birth anniversary of the legendary author from India Mr. P.L.Deshpande. NMM welcomes you all to attend these events. 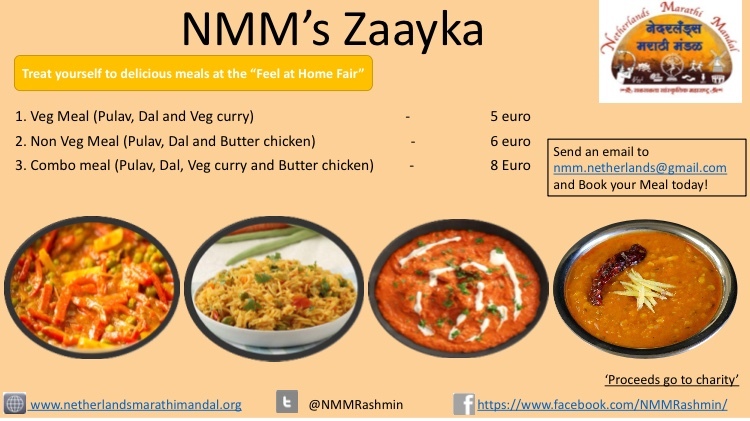 For participating in Vasantotsav and Ganeshotsav do send email to nmm.netherlands@gmail.com. For more details please keep on visiting our Facebook page and website. Below are the details. One can also find glimpses of our recent and past activities here.